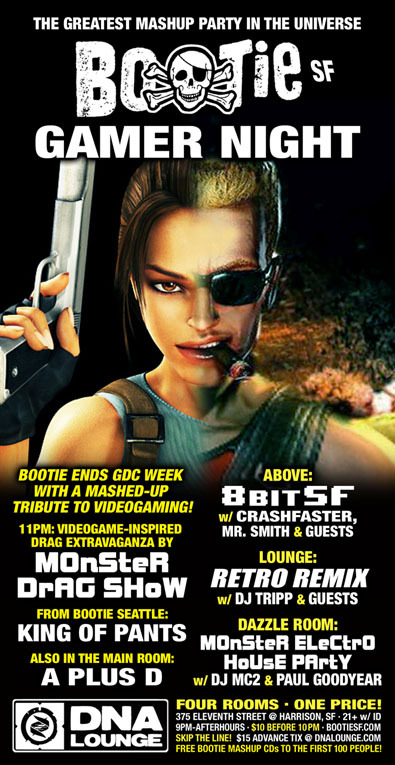 San Francisco Bootie SF: Gamer Night! Upstairs in Above, it’s 8bitSF – soak in the sweet sounds of vintage gaming machines pushed to their limit by an eclectic and international cast of 8-bit musicians and DJs. Wielding Gameboys and Nintendos to smash the boundaries of genres like trance, electro, industrial and rock, expect live performances by Crashfaster (SF) and other special guests in town for the week. Plus, DJ Mr. Smith and guests will keep the chiptune beats going between sets. In the Lounge, it’s Retro Remix, as DJ Tripp gives classic songs a modern makeover, while in the Dazzle Room, DJ MC2 and Paul Goodyear keep your feet moving and your bodies bouncing with the Monster Electro-House Party! All this, plus drag hosts Suppositori Spelling and Holy McGrail, as well as club photography by ShutterSlut, and FREE Bootie mashup CDs to the first 100 people!